Professional therapeutic massage is an age-old healing art, which can alleviate physical, mental and emotional ailments. Massage is a scientific method of manipulating the soft tissues of the body to have specific effect. Its objective is the restoration of body functions, release of tension and the re-establishment of the contours, where desirable. A well executed massage is one of life’s greatest pleasure as well as being a natural and effective pain reliever. Indian Head Massage (or champi massage) is based on the ancient Ayurveda healing system passed down from generation to generation within ancient India. Feel your stress, aches and pains disappear with this wonderfully relaxing therapeutic experience. Head Massage has been practiced in India for over a thousand years and is renowned for relieving the stress symptoms of head, face and neck. Indian Head Massage is a safe, simple yet effective therapy. Lose yourself in time, as you unwind during this particularly soothing massage. Back pain is one of the most common ailments for which people turn to massage therapies to alleviate the pain. Using firm and deliberate pressure with the help of your thumb, the knots and bunched up spots on the back are relaxed. By using the essential oil, firm and long strokes are given from the lower back to the neck. There are “reflex points” in the hands and feet that relate to specific organs and glands in the body. Stimulating those reflex points promotes health in the corresponding organ via the body’s energetic pathways. The pressure stimulates the related body regions or organs to promote healing. The treatment is also used to stimulate circulation, reduce stress and promote relaxation. Aroma therapy massage combines the power of touch with the healing and beautifying power of pure and natural essential oils. For a truly powerful and unique sensory experience bringing harmony to mind, body and soul, an aroma massage is a ‘must try’. The main purpose of Swedish massage is to increase the oxygen flow in the blood and release toxins from the muscles. Swedish massage shortens recovery time from muscular strain by flushing the tissues of lactic acid, uric acid and other metabolic wastes. It increases circulation without increasing heart load. Other possible benefits include stimulation of circulation, an increase in muscle tone, and a balance of the musculo-skeletal systems. It involves the use of kneading, stroking, friction, tapping, and vibration which provide relief from stiffness, numbness, pain, constipation, and other health problems. The birth of a child is eagerly looked forward but the discomfort that the mother has to face is not really anticipated. Pregnancy massage therapy is beneficial throughout the nine months of a normal pregnancy. This is a specialized massage given by experienced and trained therapists. Pregnancy massage has been found to reduce stress, decrease swelling in the arms and legs, and relieve aches and pains in muscles and joints. This therapy has been found to reduce anxiety and depression as well. Hot stone massage is a specialty massage that uses smooth, heated river stones. They are often basalt, a black volcanic rock that absorbs and retains heat well. These stones help to improve the blood circulation thus helping to move the blood faster around your body as also soothes the nervous system. Promotes deep muscle and tissue relaxation, alleviates stress, and releases toxins. Experience a taste of paradise with IOSIS Thai Herbal Bolus therapy. A traditional Thai massage treatment which combines Swedish massage strokes and Thai stretching with warm herbal bundles to help relax, detoxify, increase blood flow and stimulate the lymphatic fluid. The muslin balls are filled with Thai herbs and spices including lemongrass, turmeric, prai, kaffir lime, camphor and tamarind. Flying takes a toll on the skin and muscles. It is common for your skin to become dehydrated and to feel stiffness in your muscles during air travel. We have designed a specific massage to relieve these post-flight maladies. During the session, we use specialized techniques to relieve bloating, fatigue and muscle ache. The massage also encourages the movement of fluid from areas where it may collect to flow evenly through the body. 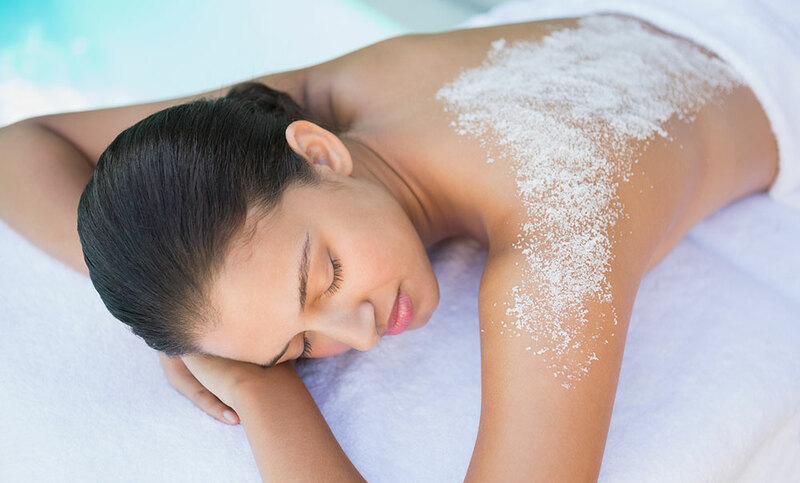 Body wraps are an integral part of any spa treatments. They offer cosmetic and therapeutic benefits for the entire body. These therapies detoxify the body as well as tighten, tone ,nourish and soften the skin. They also have a beneficial effect on joint pains.